The definition of “one who undertakes an enterprise” places emphasis on the risk and the personal efforts of the individual who owns and manages the business. 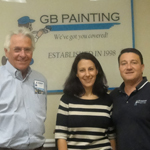 By definition John Rampino, CEO and owner of GB Painting, Inc. is an entrepreneur. Purchased by John and his wife Dawn in 2008 as a small, one house at a time, company, GB Painting has matured into a multi-faceted organization whose painting services include multi-family new construction, HOA and property management, and new commercial and residential construction. In the ensuing years, the company experienced excellent revenue growth approaching the $3 million milestone in 2011, representing an 84.2% increase over fiscal 2009; an impressive achievement for a construction related business where the painting industry endured a negative annual growth rate of 5.6%. This year, 2013, John and Dawn look forward to exceeding annual sales of $10 million. This year the company has added 13 new employees and has expanded its presence in the South Florida and Tampa markets. With dramatic growth came challenges; financial practices, business structure, marketing communications and continued new business development. To assist in meeting these challenges John and Dawn aligned with the Florida SBDC at UCF’s certified business consultant Roger Greenwald. John and Dawn are proud of the company’s achievements, not only for themselves as owners, but for their employees as well. Their dedication to their employees’ success by providing employment and career opportunities is a central tenet of GB Painting’s business model. "We are fortunate to have a growing business, but the challenges that come with growth can be intimidating. The assistance, advice and consulting we received from the Roger Greenwald over the past couple of years has been an asset to our business and an integral part in our company's rapid success."